The next wall to the right of the Mr Clean Wall. Follow the track downwards from the Mr Clean Wall, for approx 30m, until you get to a small board walk. Look left, now you are at Year Right! Nanny State is above the board walk, Funacation is the left facing corner. On the left end of the Year Right Wall. Work your way up the left facing corner, at the 3rd bolt move up the right face, to the slab at the top to finish at the Retrobolitix rap station. Find at the left side of the crag. Climb up through the bulge, then move through the delicate moves onto the crack, which takes a cam, approx 40mm, then cruise to the rap station. Move up featured slab. 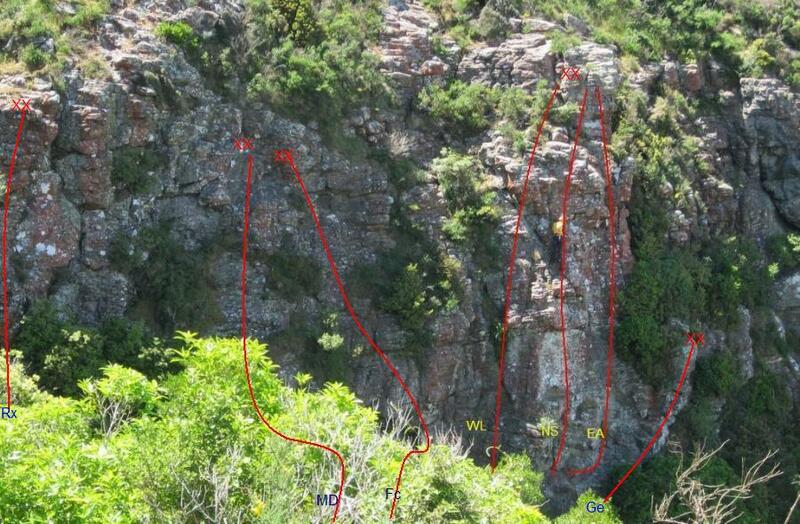 Go left around arete, into the overhung corner, venture left wards, then finish up face to rap station. Climb up Lh facing corner, exit corner R-wards, and go back Left above overhang, ascend slab to rap stn. Starts up the weakness 2m R of WL. moves up face following the line of bolts through the overlap to finish. Start at the base of Nanny State. Move R-wards following bolts. Climb the corner up throught the roof, Trad gear required. Sometimes you find yourself falling from Grace. Stick clip the first bolt and enjoy the boulder start. Ascend up the overhung pillar veering rightwards.